If you would like to learn to play the guitar then we have a variety of options available at Lamp House Music. For children we have the choice of group or one-to-one guitar classes, and for adults one-to-one lessons can be organised. All lessons are taught by one of our fantastic tutors in the warm and welcoming environment of Lamp House Music. Learn guitar as a beginner or develop your existing skills with one of our experienced tutors in a relaxed, friendly environment. Individual guitar lessons can be organised at a weekly time that suits you and can be tailored to your specific needs and music tastes. Guitar lessons are available for all levels of abilities and are taught by our great professional guitarists/tutors. Children’s group guitar run throughout the whole of Saturdays and there is one class on Friday afternoons. Our Group Guitar classes are taught in small groups of up to a maximum of eight students per class and are best suited to ages 8+ Complete Beginners classes available. 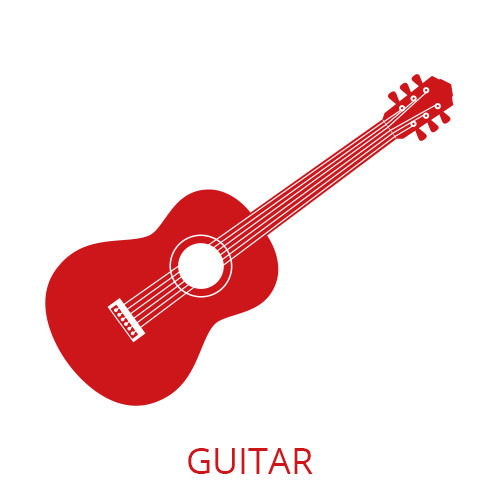 Children’s group guitar classes are taught by our enthusiastic and experienced guitar tutors in the fun and friendly environment of Lamp House Music, based in Haddington, East Lothian. Tutors will use popular music with which young pupils are familiar to add to the enjoyment of learning. Students are grouped by ability and by age, 30 minute group classes are £10 per week, 45 minute classes cost £12 per week. We are happy for you to pay for the first lesson to try out a guitar class (we can even provide a guitar!) thereafter we ask that you commit to the term. Payment can be made weekly. Should you prefer – one to one guitar lessons for children can also be organised on a weekly basis, and are available on a variety of days. Lessons can be tailored to all levels, from complete beginners onwards. However, please note that due to the huge popularity of our lessons, there is limited availability for one to one places – please contact us for more information.